PARKLAND, Fla. (AP) — The criminal case against the gunman accused in the Florida high school shooting returns to court Tuesday with prosecutors seeking hair samples, fingerprints, DNA and photographs of the suspect. Nikolas Cruz, who has been charged with 17 counts of murder, will not appear in court because he waived his right to attend the hearing. He is being held without bail at the Broward County Jail. In a separate court matter, Cruz's lawyers are seeking to disqualify a judge from presiding over the case. The defense says in court papers that Circuit Court Judge Elizabeth Scherer is biased in favor of prosecutors, threatening Cruz's right to a fair trial. Cruz, who is 19, signed an affidavit in a barely legible printed scrawl that resembled the writing of a young child. Stoneman Douglas students Katherine Guerra and Bela Urbina, both 15, stood together to argue for a ban on assault-style rifles. "This weapon has killed so many people. It is a militarized weapon that we don't need. We don't need civilians to have it," Urbina said. In reference to hunting, Guerra added, "Do you think that your sport is more important than human lives? And if you believe that, you need to reassess yourselves." The students received thunderous applause. A similar House bill was going to be considered by a committee on Tuesday. 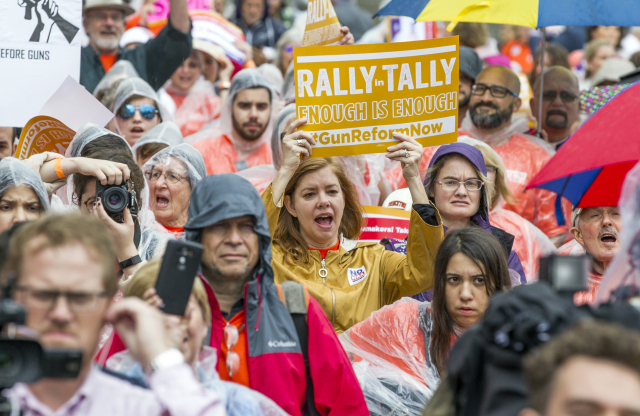 Bused in from around the state, protesters wore orange T-shirts saying #GunReformNow. One held a sign with an image from the movie "The Sixth Sense," with the words "I SEE DEAD PEOPLE ... THANKS TO THE GOP AND NRA." Another said "Hey Lawmakers! Take the Pledge. No NRA Money." The Florida House is expected to subpoena records from Broward County Sheriff Scott Israel and several agencies that interacted with Cruz. Florida Gov. Rick Scott's office has asked the Florida Department of Law Enforcement to investigate the police response, and the agency confirmed it would begin the probe immediately. Scot Peterson has been called a coward and worse for failing to stop the massacre. The criticism intensified as President Donald Trump blasted the deputy and other officers who were there, saying they "weren't exactly Medal of Honor winners." Peterson's attorney issued his first public statement about the attack, saying it was "patently untrue" that the deputy failed to meet sheriff's department standards or acted with cowardice at the scene of the Feb. 14 assault. He resigned after Broward County Sheriff Scott Israel said he felt sick to his stomach over his deputy's failure to intervene. "Let there be no mistake, Mr. Peterson wishes that he could have prevented the untimely passing of the 17 victims on that day, and his heart goes out to the families of the victims in their time of need," attorney Joseph DiRuzzo said in the statement. The sheriff's account of Peterson's actions that day was a "gross oversimplification" of the events, the attorney said. The sheriff's office declined to comment, explaining that Peterson's conduct is being investigated by its internal affairs division. Under state law, the agency is prohibited from discussing the matter until that investigation has concluded.